An Interfaks source in the Defense Ministry says Air Forces CINC, General-Colonel Aleksandr Zelin might be retiring on age grounds. The rumor goes that Zelin’s Deputy for Aviation, General-Lieutenant Igor Sadofyev will relieve him, while Zelin moves into a defense industry job. RIA Novosti reports the same story, citing several media outlets. The Air Forces spokesman, meanwhile, says the VVS cannot comment because it doesn’t have any information to this effect. He says the story of Zelin’s possible departure may have surfaced because of the downgrading of the service CINCs. It’s interesting that age was cited since Zelin’s only 57, and can serve until age 60 under the law. He’s headed the VVS since May 2007. The three-star general was the subject of dismissal rumors in 2009 when the General Staff Chief and Defense Minister were allegedly unhappy with his insufficient command of air-space (aerospace) defense (VKO) issues. See Newsru.com and Grani.ru for that story. 2011 should be interesting on the Aerospace Defense (VKO or ВКО) front. The President’s poslaniye has been turned into orders, including Medvedev’s directive to unify missile defense (PRO), air defense (PVO), missile attack warning (PRN), and space monitoring systems under the command and control of a single strategic command before next December. This issue will likely take more than a year to come to any kind of resolution. Moreover, it’s likely to be a bruising bureaucratic battle royale over control and organization that does nothing to improve Russia’s military capabilities, certainly in the near-term and possibly longer. Both Deynekin and Svpressa.ru below make the point that there are real live officers who’ll get jerked around (again) by major moves in aerospace-related branches. Konovalov wonders whether the Kremlin won’t spend too much effort against the wrong threat. According to RIA Novosti, a Defense Ministry source says the issue of establishing this command by taking PVO from the Air Forces (VVS) and giving it to the Space Troops (KV) is being worked. And he doesn’t rule out that “significant organizational and structural changes” could occur in the KV. But, of course, the final decision on this strategic command lies with the Supreme CINC. He also warned the Defense Ministry against a reorganization which creates more tension in the officer corps. Olga Bozhyeva in Moskovskiy komsomolets reviews the past history of transformations involving PVO and Missile-Space Defense (RKO), and concludes the VVS and KV will both end up subordinate to a new command under the General Staff. Interviewed for Novyy region, Leonid Ivashov sees nothing new in Medvedev’s order on a unitary VKO command. But it will be an uphill task. He says Russia currently has practically no missile defense system. The PVO system’s been reduced to point defense, and it doesn’t cover much of Russia’s territory. More than anything, he sees it as a defense-industrial issue – can the OPK provide the military with new air and space defense systems? Svpressa.ru describes how RKO and the Military-Space Forces (VKS) went to the RVSN under Defense Minister Sergeyev in 1997, then PVO went to the VVS, and they had to create the KV as a home for elements the RVSN no longer wanted in 2001. The article concludes that this kept VKO divided in half. Now VVS and KV generals are already hotly debating how Medvedev’s new order on VKO will be implemented. Svpressa.ru asked Aleksandr Konovalov what he thinks. Konovalov says VKO is being created against the U.S., when Russia faces more immediate threats from countries without any space capabilities. While Russian air and aerospace defenders were meeting in Tver last week, former Air Forces (VVS) CINC, Army General Anatoliy Kornukov gave Interfaks his opinions in a Moscow news conference. Kornukov is a member of a group calling themselves the ‘Extradepartmental Expert Council on the Problems of RF Aerospace Defense.’ He also advises the General Director of Almaz-Antey. “I think the correct decision would be for everything to be located in one set of hands, and one person answering for the condition, training, employment [of PVO means]. He reminded the audience that, once the province of PVO, control of anti-missile defense went first to the RVSN, and now resides with the Space Troops. Olga Bozhyeva reported that Kornukov wants RKO, specifically the 3rd Missile Attack Warning System Army to come to the Air Forces, and the latter should change its name to reflect its aerospace orientation. He doesn’t like the idea of creating a new armed service called aerospace troops that would control PVO. Asked about Russia’s ability to defend against potential missile attacks from North Korea or Iran, Kornukov called the country’s capability to counter these threats ‘limited.’ He said, although the S-400 can cope with air-breathing threats, Moscow has no means for countering ‘operational’ (i.e. intermediate-range) missiles. 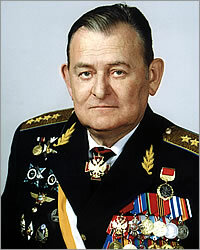 Kornukov is an old PVO guy–albeit an Air Defense Aviation pilot; he was the first CINC of the VVS after it subsumed PVO. Maybe he, and the others, are just shilling for Almaz-Antey to get even more from the State Defense Order. Or perhaps their assessments are sincere.